Vytex® 100% Natural Latex Topper Collection. Vytex is a revolutionary plant-based raw material sustainably harvested from the Hevea brasiliensis tree. It is then treated with a non-toxic multi-patented process to virtually eliminate all of the antigenic problem-causing proteins that can result in an allergic reaction to natural rubber latex without the use of harmful chemicals typically found in non-latex alternatives. This makes Vytex the cleanest rubber product on the market. Vytex is free of petroleum, volatile organic compounds (VOCs), harsh chemical and filler agents. Vytex is natural, renewable, stronger, and safer. Vytex® 100% Natural Latex Topper Collection. Vytex is a revolutionary plant-based raw material sustainably harvested from the Hevea brasiliensis tree. It is then treated with a non-toxic multi-patented process to virtually eliminate all of the antigenic problem-causing proteins that can result in an allergic reaction to natural rubber latex without the use of harmful chemicals typically found in non-latex alternatives. This makes Vytex the cleanest rubber product on the market. Vytex is free of petroleum, volatile organic compounds (VOCs), harsh chemical and filler agents. Vytex is transforming everyday items into more durable, stronger, and longer lasting products. Vytex outshines the competition in energy efficiency, chemical use reduction, raw materials and green technology. Vytex can be used in a variety of household items as well as medical and professional products. The possibilites are truely endless with Vytex. PURE CLEAN ALLERGY FREE Made with Vytex® Natural Latex: a revolutionary patented formula that removes all allergens for a healthier sleep. COOL BREATHABLE COMFORT The ventilated design allows for a cooler sleep. Latex has a natural airflow which discourages moisture and heat buildup. 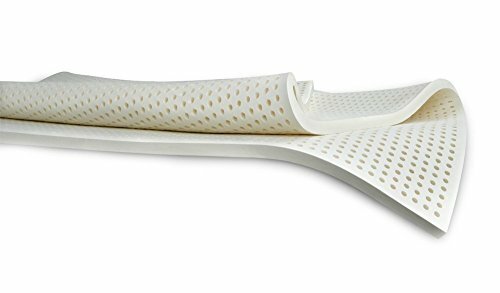 UPLIFTING SUPPORT: FLOAT INSTEAD OF SINK Natural Latex gently conforms to your body, providing better pressure relief and keeps you on top of the mattress. CONSISTENTLY COMFORTABLE & DURABLE Pure comfort and support. Our natural latex offers a consistent and even sleep surface for the same comfort and feel no matter where you are on the mattress. SUSTAINABLE RESPONSIBLE ENVIRONMENTALLY FRIENDLY Ecologically-minded and made from naturally derived, renewable resources. If you have any questions about this product by Vytex, contact us by completing and submitting the form below. If you are looking for a specif part number, please include it with your message.